Cunliffe, D. and Petterson, S. 2019. Australian guidelines for water recycling - setting health based performance targets and safe use of wastewater. In: J.B. Rose and B. Jiménez-Cisneros, (eds) Global Water Pathogen Project. http://www.waterpathogens.org (S. Petterson and G. Medema (eds) Part 5 Case Studies) http://www.waterpathogens.org/book/australian-guidelines-for water-recycling Michigan State University, E. Lansing, MI, UNESCO. The lack of comprehensive national recycled water guidelines was identified as a barrier to increasing use of wastewater, greywater and stormwater. To remove this barrier a set of guidelines was developed, as part of the Australian National Water Quality Management Strategy, to provide clear direction to scheme developers and regulators on how to design, manage and operate recycled water schemes safely and sustainably. The objective was to provide guidelines that are flexible and provide a fit-for-purpose water quality approach that applies to all forms and sizes of recycled water schemes ranging from small rural to large urban schemes. The guidelines apply to end-uses ranging from drip irrigation of woodlots, to urban and agricultural irrigation and potable re-use. In Australia, as experienced in much of the world, the beginning of the 21st century has been characterised by increased pressure on freshwater supplies in all large cities and most regional areas. This pressure is likely to increase in response to climate variability and population growth. It was identified that traditionally underutilised wastewater, grey water and stormwater need to be considered as valuable water resources that can either supplement or replace drinking water supplies. The guidelines were developed to provide practical guidance on designing, managing and operating recycled water schemes with a focus on defining water quality requirements that are fit-for-purpose. 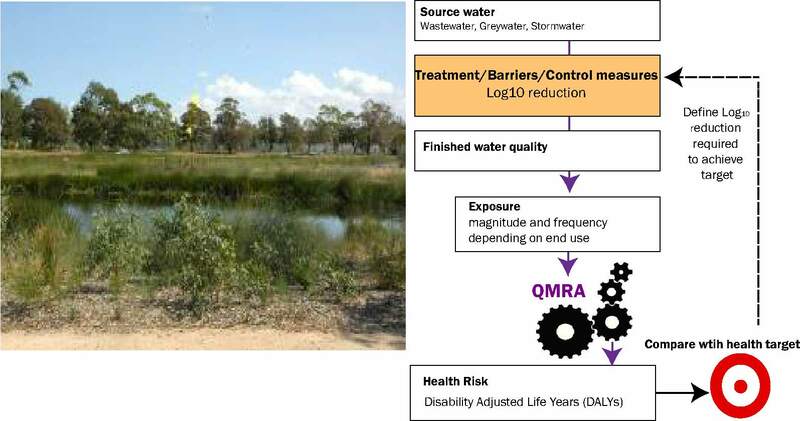 From a public health perspective, within a risk management framework, the focus was to identify microbial performance targets in the form of log10 reductions of enteric pathogens taking into account the type of source water and the intended end use. The targets for all forms of recycled water use were developed using a QMRA based approach. The methodology adopted in the guidelines was necessarily conservative without being overly restrictive; many of the QMRA assumptions, and expected reductions achieved by different barriers encapsulated considerable uncertainty. However, the QMRA provided a structured quantitative framework to allow for a diverse range of potential recycled water uses to be evaluated. Most importantly, the approach allowed for appropriate combinations of treatment and non-treatment options to ensure safe use of recycled water. The guidelines include log10 reduction targets for various uses of wastewater, greywater and stormwater and provide a process for determining targets for alternative end-uses. The guidelines then describe how these targets can be achieved using treatment and non-treatment options. Use of non-treatment options reduces the focus on treatment and can reduce the cost of recycled water schemes. Log10 reduction credits are assigned for non-treatment options based on exposure reductions achieved by options such as crop restrictions and irrigation restrictions (e.g. drip irrigation rather than spray irrigation, night time only irrigation).